20th Annual Community Read Aloud!! Join the 20th Annual Community Read Aloud! It's hard to believe it has been 20 years since Success by 6 of United Way of Mid Coast Maine launched the first Annual Community Read Aloud. This year's event will be held Friday March 1st. 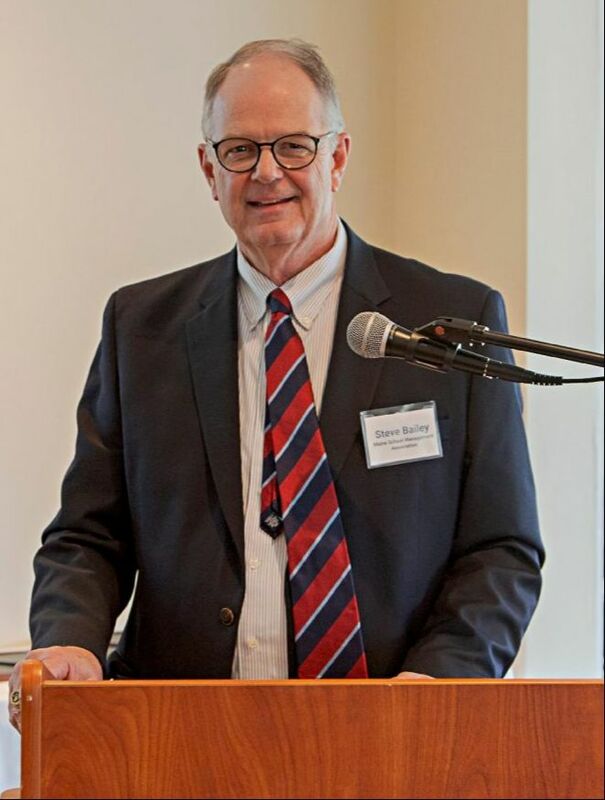 The executive director of the Maine School Management Association discussed many issues facing Maine schoolchildren, including bullying and suicide, during the annual meeting of the United Way of Mid Coast Maine on Tuesday. Steve Bailey, of West Bath, said school report cards are based on academic results and standardized test scores, but Bailey asked if there was other things schools should look at to gauge a student’s performance. 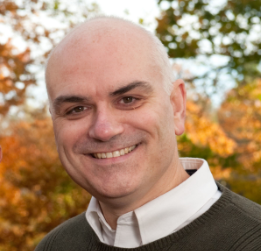 The former superintendent said a Maine Integrated Youth Health Survey showed that 4 out of 10 students feel like they don’t matter to their community, and he said half of the middle school students in Sagadahoc County reported being bullied on school property. 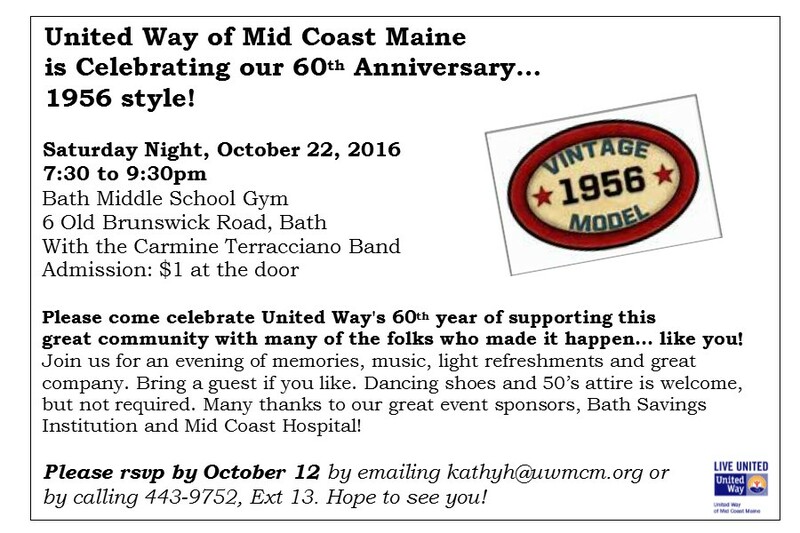 With the fall campaign in full swing, United Way of Mid Coast Maine will pause for some fun on October 22 with a 1956 –themed celebration at Bath Middle School Gym. Guests will be treated to light refreshments, 1950s era music from the Carmine Terracciano Band, an opportunity to connect with fellow United Way supporters, and plenty of memories – all for the 1956 admission price of $1. Event sponsors include long-time supporters Mid Coast Hospital and Bath Savings Institution. All United Way supporters are encouraged to attend the celebration, and can rsvp to Kathy Higgins by calling 207-443-9752, Ext. 13 or via email at kathyh@uwmcm.org. Chris Chase — Coastal Journal The Mustard Seed Bookstore was one of the top five Bath businesses that collected Dollars for Daipers. BATH — United Way of Mid Coast Maine’s Dollars for Diapers fundraising campaign has come to a close after raising $4,594. Bath Savings Institution donated $1,000, an anonymous donor made a $500 contribution, and the Bath Rotary gave $1,000 to the cause. In total, the money raised should be able to keep local young families outfitted with diapers for nearly a year. In addition to the money raised, posters and displays pinned all over downtown helped raise awareness of an issue that many people don’t think about. “It wasn’t money in canisters that put us over the top; it was the awareness of people who said, ‘how can I help?’” said Jennings. The top five businesses that received the most canister donations are One Stop Deli, Witch Spring Hill Ice Cream, Now You’re Cooking, Five County Credit Union, and Mustard Seed Bookstore. Wendy Morris, owner of One Stop Deli, said she had no idea that her business raised the most. She attributed it to the reputation of United Way. Gates said the generosity of people in town doesn’t surprise her, as the donations and outpouring of support she recieves on a regular basis always exceeds her expectations. “This community is just itching to make a difference, and when they find something they can sink their teeth into, they do,” she said. United Way of Mid Coast Maine is accepting applications for new funding partnerships with Mid Coast non-profit agencies that work to improve people’s lives in the core building blocks of education, financial stability, and health. There is a two-step process to apply for United Way funding for a two year cycle starting July 1, 2017, and going through June 30, 2019. New agencies must first apply to become Eligible for Funding, and this application deadline is no later than noon, Tuesday, November 1, 2016. During this first step, United Way volunteers review the agency’s finances and financial control systems, how well the agency is governed, and how well the agency will account for funds donated during United Way’s annual Campaign. Once an agency is found to be eligible for funding, then the agency may apply in February to one of United Way’s four Community Solutions Councils for specific program funding. Volunteers review applications and meet with program representatives in the spring to determine how well this particular program addresses one or more of the 23 Community Goals identified by United Way in a community outreach and strategic planning initiative. The volunteers make specific program funding recommendations to United Way’s local Board of Directors. 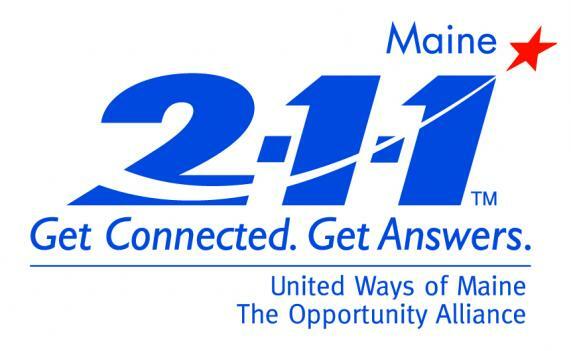 Organizations interested in applying for partnership should contact John Washburn, Director of Finance & Administration at United Way of Mid Coast Maine, 34 Wing Farm Parkway, Bath, 04530, 443-9752, immediately for a copy of the Partnership Agreement and Eligibility Application. Meetings or telephone conversations to explore partnership feasibility are welcome. These applications must be completed and returned no later than noon, Tuesday, November 1st to be eligible for consideration of funding during the two year cycle beginning July 1, 2017.